The global mining giant, Freeport McMoRan, is threatening to punish workers at its Indonesian unit who are threatening to strike over employment conditions. 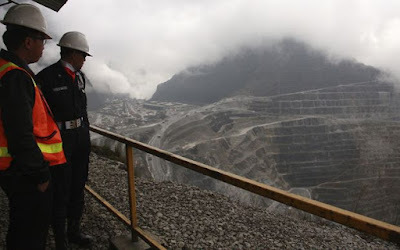 Freeport-McMoran mine in West Papua. Tensions have been rising around the massive Grasberg mine in West Papua after Freeport laid off thousands of workers to stem losses from an ongoing dispute with the Indonesian government. The Freeport workers' union said the company's efforts to reduce its workforce by as much as 10 percent have had extensive impacts, and announced plans for a 30-day strike from 1 May. Indonesia halted Freeport's copper concentrate exports in January under new laws that require Freeport to get a special licence and divest a 51 percent stake in its operations, among other measures. Negotiations had been underway, and Reuters reported an agreement was expected to be reached soon to allow exports to temporarily resume. But a strike would severely impact those efforts to ramp up production. A Freeport spokesperson, Eric Kinneberg, said absenteeism would be tracked at the mine, and disciplinary action would be enforced under the terms of a collective agreement.